Capable, durable, powerful and fast, the 2018 Dodge Durango lineup offers consumers a lot of variety. The 2018 Dodge Durango lineup includes three engine options, two drivetrains and seven trims. The newest trim to join the lineup is the Dodge Durango SRT and it is the most powerful of all the trims. The base engine is a 3.6-liter V6 engine and it generates 295 horsepower and 260 lb-ft of torque. The engine features ESS (engine start-stop), which conserves fuel by turning off the vehicle’s engine off when it is idling. When equipped with the 3.6L engine, the Durango has a maximum towing capacity of 6,200 pounds and an average fuel economy of 19 mpg in the city and 26 mpg on the highway. Buyers that want a more powerful engine can opt for the 5.7-liter HEMI V8 engine, which produces 360 horsepower and 390 lb-ft of torque. The extra power produced by the 5.7L engine boosts the Durango’s towing capacity 1,000 pounds, which means a Durango equipped with the 5.7L engine has a maximum towing capacity of 7,200 pounds. The most powerful engine on the lineup is the 6.4-liter HEMI V8 engine and it is new to the 2018 model year. The 6.4L produces 475 horsepower and 470 lb-ft of torque, and it helps the Durango accelerate from 0-60 mph in 4.4 seconds, which makes the Durango the fastest three-row SUV on the market. Thanks to all of the power, the Durango SRT has a best-in-class maximum towing capacity of 8,700 pounds. The 6.4L engine is only available on the Durango SRT, which comes standard with all-wheel drive and a variety of performance parts that help the SUV to maximize all of the engine’s power. To give buyers more control over the features they need and want, the Durango is available as a five- or seven-passenger vehicle and with a variety of interior options. The Durango SXT comes standard with cloth seating, and leather seats are an available option or a standard feature on other Durango trims. The Durango has plenty of space for people and when the second-row and third-row seats are folded down, there is 84.5 cubic feet of cargo capacity behind the first row. The Durango is also available with heated front and second row seats and ventilated front row seats. All 2018 Durango models are equipped with a touchscreen and a rearview backup camera. The Durango SXT is fitted with Uconnect 4.0 and a 7-inch touchscreen, and the Durango Citadel, Durango R/T, Durango Citadel Anodized Platinum and Durango SRT are equipped with Uconnect 4.0C with navigation and an 8.4-inch touchscreen. For safety and convenience, the Durango is equipped with integrated voice command with Bluetooth, so users can give verbal commands to do certain phone features while keeping their hands on the wheel and their eyes on the road. Available audio system options include a 6-speaker sound system, a 9-speaker sound system and the available Beats Premium audio system. Currently in its third generation, the 2018 Durango has a sporty and functional exterior design. The capless fuel fill is a convenient feature that makes it even less likely a driver will get gas on their hands while refueling and the acoustic windshield help keep the cabin quiet. The Durango comes standard with automatic halogen headlamps, projector fog lamps and LED tail lamps with red accents. The Durango SXT and Durango SXT Plus ride on 18-inch aluminum wheels, and other available wheel choices include 20-inch hyper black or gloss black aluminum wheels, or 20-inch satin carbon finish aluminum wheels. A power liftgate is standard on the Durango GT, Durango Citadel, Durango SRT, Durango Citadel Anodized Platinum. As the performance trims, the Durango R/T and Durango SRT have some exterior features other Durango trims don’t have. 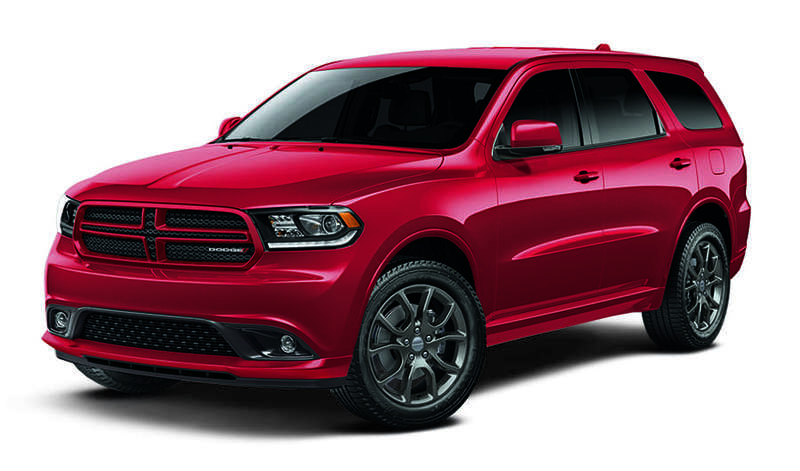 The Durango R/T and Durango SRT feature new performance features. New features include a functional SRT hood with center air inlet duct, a new front fascia and lower valence and a new widebody exterior design. The 2018 Dodge Durango offers consumers more than 60 available safety and security features. The Durango comes standard with seven airbags, hill start assist, keyless go, ready alert braking and rain brake support. For the 2018 model year, the Durango R/T, Durango Citadel and Durango SRT come standard with Front Park Assist joins ParkSense® Park Assist System with sensors in the front bumper to detect obstacles. The 2018 Dodge Durango SXT has a starting MSRP of $29,995 (plus destination fee). All Dodge models are backed by a three-year or 36,000-mile limited basic warranty and a five-year or 60,000-mile limited powertrain warranty. Dodge also offers complimentary roadside assistance for five years or 60,000 miles. University Dodge is located just outside of Miami, and we have a great selection of Dodge and Ram vehicles. Visit us at University Dodge for a test drive of the brand new Dodge Durango today.